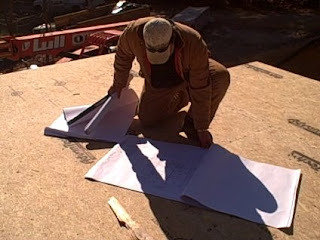 Asheville Framing and Building: Reading Blue Prints is how the Job gets done Right! Reading Blue Prints is how the Job gets done Right! If you are in the building industry you know that reading blue prints PROPERLY means all the difference in the world to getting the job done right- the first time around. Our men at Asheville Framing & Building know how to read and understand blue prints. We do not except mistakes and the only way to avoid most of them is to be able to comprehend which wall goes where, what size measurement to cut this particular 2X, etc. We consistently refer back to the plans to confirm our progress is correct. We understand the importance of prints and using them daily. If one measurement is off... the framing inspection could fail which means trouble across the board. We make sure our work is correct!